Non-stop casino action is the center of the Harrah's Las Vegas. 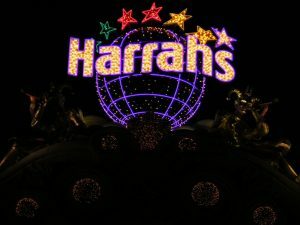 Located right in the heart of all the action, Harrah's festive atmosphere and the buzzing location is perfect for anyone looking to celebrate the affordable Vegas fun, found at the Harrah's. Now there isn't a military discount, but there are still some KILLER deals and specials you absolutely need to take advantage of. Like all other Caesars properties, there is not a Harrah's Las Vegas military discount. However, there are always some amazing room rate specials and promotions, including free buffet passes and so much more. For more information about these Harrah's Las Vegas deals, see below. Happy staying! For more Las Vegas resort military discounts, promotions, and special deals similar to the Harrah's Las Vegas military discount, be sure to check out our awesome listing of over100+ Las Vegas resort, casino, and show military discounts and deals.